Following research by Alupro into the UK closure market via both its members and those of British Glass, it was discovered that approximately 5,000 tonnes of aluminium from caps and closures could be recovered. At today’s raw material prices that’s over £2 million worth of aluminium that could be diverted from landfill. 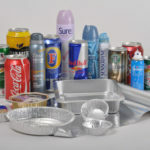 It was also highlighted that there is currently no end-user messages or communication focussing on recycling aluminium caps and closures via either kerbside collections or bring bank systems throughout the UK.during the glass recycling process. The “You Can Leave Your Cap On” initiative launched in Kent on 3rd July 2013, as part of a trial campaign with four local authorities. The communications programme has been designed to encourage households to screw the tops back on empty glass bottles – such as wine, spirits and olive oil – before placing them out to recycle through local bring banks or kerbside recycling containers. 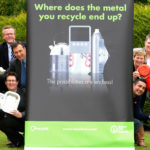 Sevenoaks District Council is the first authority to trial the new campaign materials, with Dartford, Portsmouth and Bedford also taking part. Sevenoaks is now communicating the “You Can Leave Your Cap On” message on each of its 223 recycling bring banks located at 50 sites throughout the district which are now branded with new eye-catching bright green stickers (shown above) provided by Alupro. The message to residents will be reinforced using various council communication channels such as its website, newsletter and local media. The innovative caps and closures recycling campaign is the first of its kind in Europe and Alupro is keen to ensure that the collected material is officially reported through the PRN system. Following the four initial local authority trials over the next few months, results will be measured and announced by Alupro later in the Autumn.